I have just returned from a weekend in New York City and was reminded of the Cathedral of St John the Divine as I looked at the construction work in our sanctuary. St. John’s is a socially engaged cathedral housing the best of ancient and contemporary spiritual art. 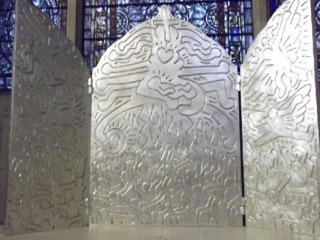 I used to go there when I needed a break from seminary and sit in my favorite side chapel contemplating a silver triptych created by Keith Haring. Haring’s signature style is brought to bear on a fairly traditional subject: The Life of Christ. Knowing how deeply his art spoke to our generation in the midst of the AIDS pandemic made the work poignant, honest, humorous, iconoclastic, painful and beautifully hopeful. While this piece of art spoke volumes to me, to the community that worships there, one of the most important visuals is unfinished. There is a church tower that has never been completed. It is still swaddled in scaffolding, and I’m sure many a tourist has thought, “What a shame. It would be so beautiful without this eyesore.” But to the community, this ‘eyesore’ calls them to remember that the mission of building the equitable and loving kin-dom of God is a work that remains incomplete. The hope of the world is found in communities who know that the Way of Love takes ongoing commitment, sharing, change and dedication to build together.